CTD profile data are presented from the North Atlantic Tracer Release Experiment cruise Charles Darwin 68 as reported by Watson & Ledwell et al. (1992). The CTD profiles were taken with a Neil Brown Systems MkIII CTD (s/n 01-1195). This was mounted in a sled custom built by WHOI along with a rosette multisampler (12 bottle 10-litre type manufactured by General Oceanics) and 1.2 litre Niskin bottles. The CTD was fitted with a pressure sensor, conductivity cell, and a platinum resistance thermometer. 4 reversing thermometers were also attached to the sled. The sled was at the centre of a much larger vertical array of custom designed water samplers (for SF6), interspersed with SEACAT CTDs. The whole array was towed through the water for a period of several hours. Each sampler tow was preceded by a downcast to 500m at about 25m/min, and was followed by an upcast from 500m at roughly the same speed. Since the ship was generally moving at about 1kt (30m/min) the descent and ascent angles are about 45° from the vertical. A total of 59 casts were conducted (01 - 59). Casts 01 - 15 were test casts and casts to determine background SF6 concentrations. Up to 7 salinity samples and 4 reversing thermometer values were acquired during each cast for the calibration of the CTD. The raw data have had spikes near the rosette trips removed. There were still obvious spikes of noise in the data. The data from the CTD descents and ascents were interpolated to standard levels every metre from 10m to 500m, where data were available. These were then averaged at the 1m intervals. The MkIII CTD was calibrated for temperature and pressure on shore prior to departure. The temperature calibration was checked throughout the cruise with four digital reversing thermometers mounted on the sampling sled. However, the strong temperature gradients and the mismatch in time and space between the reversing thermometers and the CTD probes resulted in rms noise of around 0.090°C. Therefore the shore-based calibrations, which should stand to better than 0.004°C were relied upon for temperature. Salinity calibrations were also performed throughout the cruise, with samples from the 5-litre Niskin bottles during the background casts and from 1.2-litre Niskin bottles mounted horizontally on the sampling sled during the tows. They showed a consistent salinity error of -0.022psu for the MkIII system for the part of the water column sampled. This correction was applied in processing the CTD data. 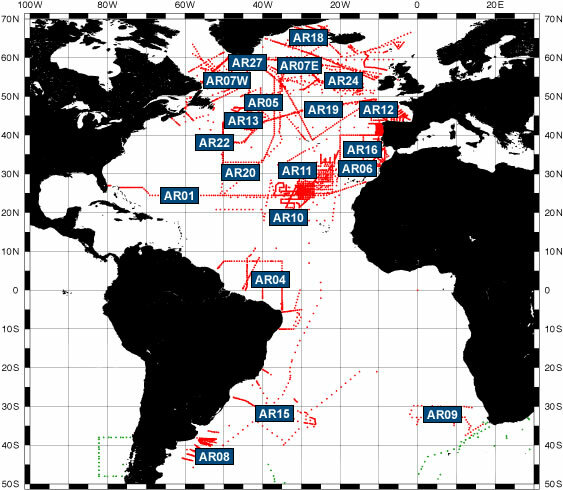 The processed CTD data are considered as accurate as possible; no post-cruise adjustment of the data was conducted. The CTD data were received as 1db averaged pressure sorted down cast data. Parameters were pressure (dbar), temperature (its-90) and salinity (pss-78). The data were converted into the BODC internal format (PXF) to allow the use of in-house software tools, notably the graphics editor. Spikes in the data were manually flagged 'suspect' by modification of the associated quality control flag. In this way none of the original data values were edited or deleted during quality control. Very little flagging was required for these data. Once screened, the CTD data were loaded into a database under the Oracle relational database management system. The start time stored in the database is the tow deployment time, and the end time is the start time + 60 minutes. 1 day was subtracted from all these times after comparison with the cruise report and navigation. Watson, A.J. & Ledwell, J.R. et al. (1992). RRS Charles Darwin Cruise 68, The North Atlantic Tracer Release Experiment (NATRE): First Sampling Leg. Plymouth Marine Laboratory, Cruise Report.